Imagine an inviting and electric yet refined space where people gather to imbibe, socialize, and feel at home. 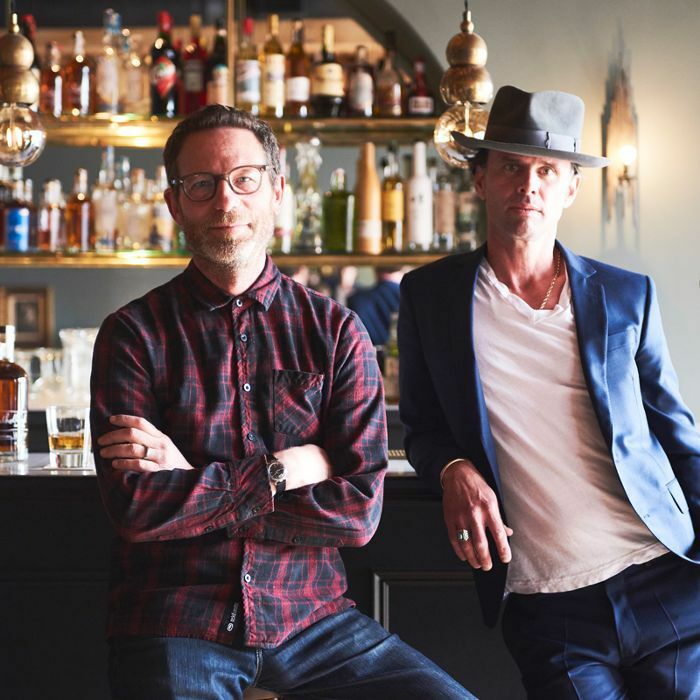 That's exactly what actor Walton Goggins and cinematic cameraman Matthew Alper had in mind when creating the Mulholland Room, a place that embodies their love for Los Angeles and the very spirits they've cultivated for their own company, Mulholland Distilling. What started as a passion project for founder Alper about five years ago has turned into a modern-day salon that's garnering attention. Goggins partnered with long-time friend Alper shortly after he set out on his endeavor and the two have since created a whiskey, gin, and vodka under the Mulholland Distilling label. Now, their space in the historic L.A. Arts District acts as a hub for cocktail creation and their extended network. Ahead, take a tour of the eclectic L.A. space as Goggins and Alper share their story of friendship and spirits (plus, get a sneak peek at some of their finest cocktail recipes). Goggins and Alper have been friends for 20 years thanks to overlapping careers and relationships in the film and television industry. "We met through mutual friends so long ago and we have maintained a deep connection and friendship over the course of all these years," says Goggins. So when Alper had the itch to experiment with work outside of his usual wheelhouse and begin making whiskey, Goggin's was ready to jump on board. The endeavor was a natural fit for both men. "I come from a wine background," explains Alper, making him familiar with the business and practice of making alcohol. He attributes his initial desire to make whiskey to one particular interaction with a distiller in North Carolina who reminded him that while Los Angeles is home to many whiskey drinkers, there's no Los Angeles spirit. "[It] made the hair on the back of my neck stand up," the native Angeleno says. After Alper began getting to work on creating a whiskey that Angeleno's could call their own, Goggins was happy to join his friend as a partner in the budding business. "Imbibing, for me, is one of the greatest pleasures in my life," he says. The rustic, eclectic room is full of unique pieces from around the world. Exposed wood beam ceilings give the space an industrial feel, which is fitting for its location in the L.A. Arts District. Framed artwork and individual details make the room feel like a home. Care and attention to detail were clearly paid to every nook and cranny of the Mulholland Room, from coffee table books to one-of-a-kind art. What started with whiskey has since expanded to gin and vodka as well. Alper began by traveling the country, tasting whiskey and meeting distillers along the way. Mulholland Distilling now sources its whiskey from Indiana before taking it to Kentucky to blend it with a high rye bourbon and aging it for a year, Alper explains. The final steps, however, happen in Los Angeles where the whiskey is blended and bottled. The creation of their gin came from a desire to produce something that would make people interested in the powerful drink. "It can be too strong or too piney or too juniper," says Alper. "Mine was about trying to create something that sort of represented what I thought was the spirit of L.A., which is inclusive. It’s a really sort of beautiful gateway into the world of gin." The final product is the result of two years spent developing the perfect blend of botanicals. Finally, their vodka is made of 100% non-GMO corn for a gluten-free spirit distilled six times. "It is sweet and soft and lovely," says Alper. While these three spirits are the only products currently produced and sold by Mulholland Distilling, you can be sure Goggins and Alper have more up their sleeve. A fully stocked bar is ready for guests of the Mulholland Room to taste the original spirits created by Alper and Goggins. This area of the room feels like a saloon straight out of an old western. Again, furniture and décor details give the space the feeling of a lived-in home. This leather chair was made for cozying up with a glass of whiskey. "Interior design is something that's always been very very important to me," Goggins says. The actor explains that his style has been largely influenced by many "trendsetters" in the worlds of art, furniture, and design whom he has met during his 27 years in L.A. But for the Mulholland Room specifically, the design tells a story of the organic lifestyle of the city, as well the honest conversations and moments shared by the people who inhabit it. "We wanted to create a space in our Mulholland Room that is a real reflection of who we are as people and the life that we have cultivated for ourselves and our travels all over the world, but also coming back to the main streets of L.A. as is reflected in our spirits," Goggins explains. He and Alper worked with interior designer Tatum Kendrick to bring their vision to life, but Goggins explains that the heart and soul of the design came from him (and hours upon hours spent on live auctioneer sites). "We had a real budget and we had about six months for our build-out," he says, which is what led them to the eclectic collection of décor that is currently housed in the Mulholland Room. Among the varied pieces are a burl wood coffee table from Florida and a 1950s Italian sectional, for instance. "When you walk in, I think people feel something that they can't quite put their fingers on, that they know that it was with care and with attention to detail yet they can sit anywhere and they feel at home," Goggins muses. "I think that those are the perfect ingredients for sharing your favorite cocktail and having a conversation," he says. For Goggins, it's all about seeing the look on people's faces when they first enter the space. "It feels really good to see people feel at home five minutes after walking into a space that you created," he says, and Alper agrees. He refers to the space built from his and Goggin's travels and experiences as "the greatest living room in the world." Exposed wood and brick add to the undone atmosphere of the room. Every corner is covered in unique art almost as intriguing as the spirits themselves. With ample seating, coffee tables, art, and rugs, it's easy to see why Alper calls this space "the greatest living room in the world." This area houses a burl wood coffee table from Florida, one of Goggin's many finds from his auctioneer searches. Pick up a bottle of Mulholland whiskey, gin, or vodka and give your mixology skills a go with these handcrafted cocktails created by Othón Nolasco of Va'La Hospitality at the Mulholland Room. Bottoms up. Pour Miller High Life in a fancy glass, and add Mulholland American Whiskey.